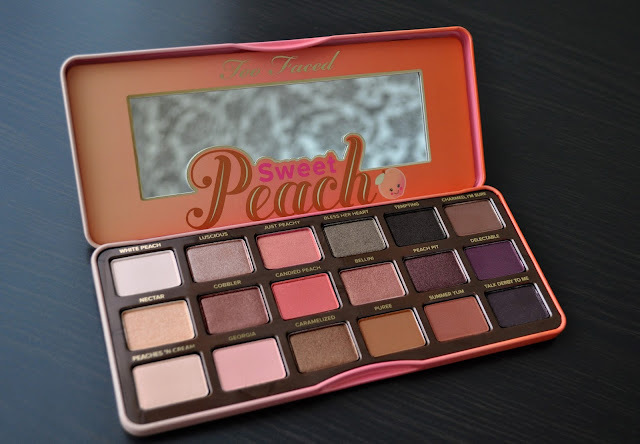 Inundated with images of the Too Faced Sweet Peach Collection all over instagram, and promo pictures of the model and her makeup in the ad (I don't know who she is, but she's stunning! 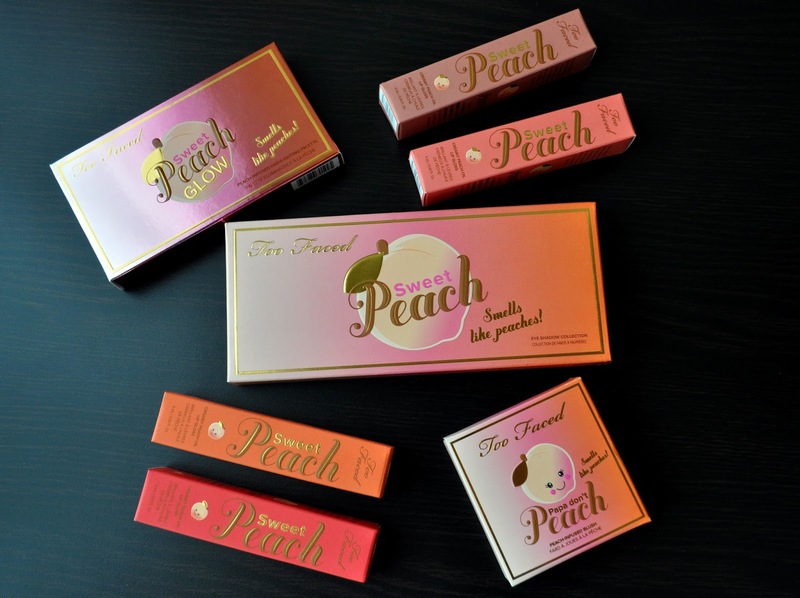 ), I had to see what all the peach fuss was about. Now, I'm sure everyone from here to Timbuktu has reviewed this collection, but I'm going to briefly give MY two yen. Delectably cute packaging that is reminiscent of my elementary tin pencil case. Again, adorable product packaging. 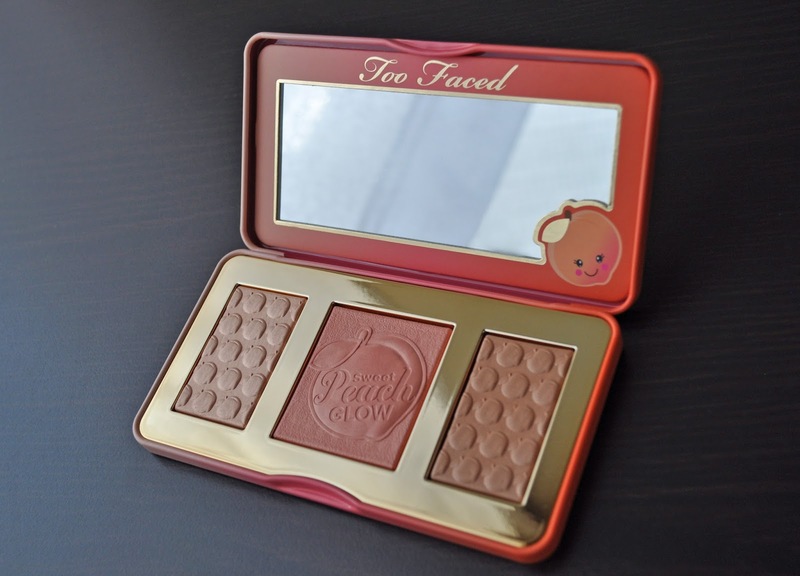 I like the color gradient of the eye and face tin cases as well as the color coordinating lip products. The Sweet Peach Eye Shadow Collection comes with a variation eye shadow finishes. With the exception of Tempting, Delectable and Talk Derby To Me (all three shades applied a little patchy, skipped on the lid and required extra work), all the shadows are pigmented and apply and blend fairly well. They wore well throughout the day without any fading or unevenness. The eyeshadows have an synthetic peach scent (all the products in this collection do), but it is tolerable. While using the palette, I inhaled some of shadow particles floating about and accidentally discovered that, not only are the shadows scented, but they are also sweet. Now, please, do not start licking the shadows. The Sweet Peach Glow Illuminating, Blushing, and Bronzing Palette is an all-in-one for your face product needs. The blush and bronzer have a satin finish; whereas the highlighter is shimmery, with micro gold glitter. 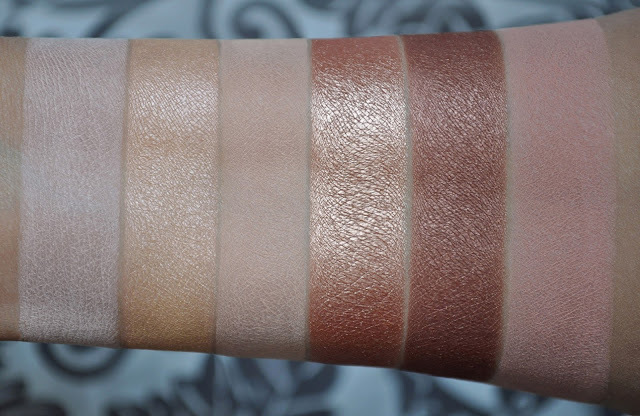 Nicely pigmented, with a silky texture, all three products give a subtle sheen. 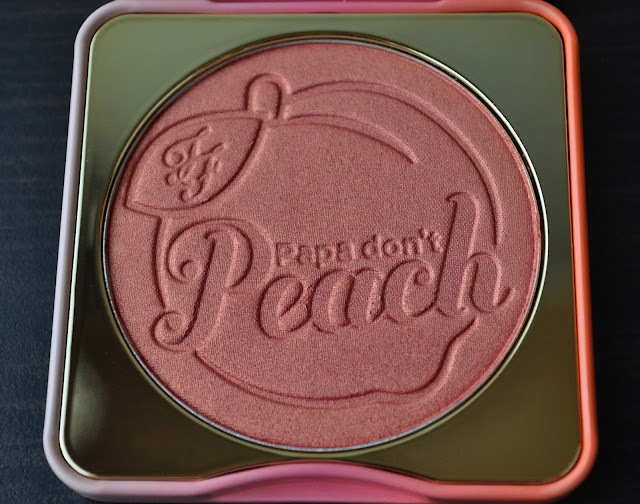 A pretty blush on its own, I also love layering Papa Don't Peach over other blushers. A pigmented formula that glides on the cheeks, Papa Don't Peach Blush's silky, luminous finish allows you to forgo the highlighter. 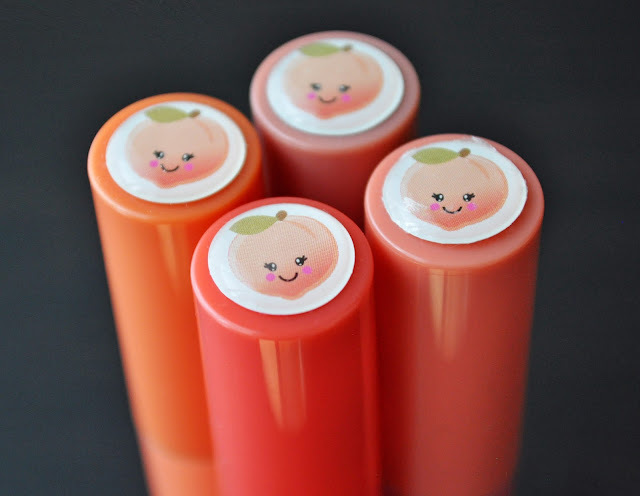 The Sweet Peach Creamy Peach Oil Lip gloss is pigmented, but I'm not a fan of the way it applies, looks, or feels. The lip gloss goes on streaky, feels uncomfortably heavy on the lips, and migrates outside of the borders of my lips. Also, if I eat, drink or digest a little of the product that gets into my mouth, it sends me into mini-fits of needing to clear my throat. The only way I've been able to bear wearing the gloss is by removing the excess with a tissue. 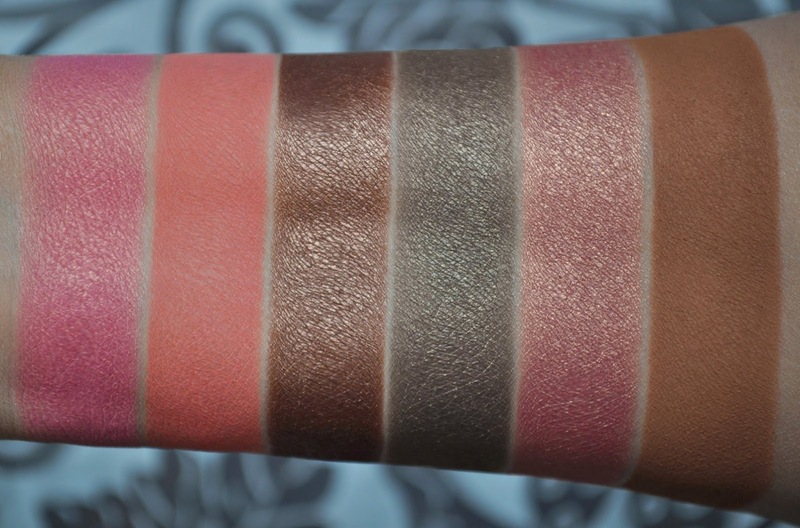 Sorry guys, these swatches were taken an a partially cloudy day. From left to right: White Peach, Nectar, Peaches 'N Cream, Luscious, Cobbler, Georgia. White Peach: a warm, pale vanilla satin with a slight peachy-undertone. Nectar: a frosted, warm, peachy-golden yellow. Peaches 'N Cream: a matte, warm, peachy-beige. Luscious: a metallic, warm, muted, brown-based, coppery-peach. Cobbler: a metallic, warm, brown-based, dark, bronzed rose-gold. Georgia: a matte, medium beige-y pink. 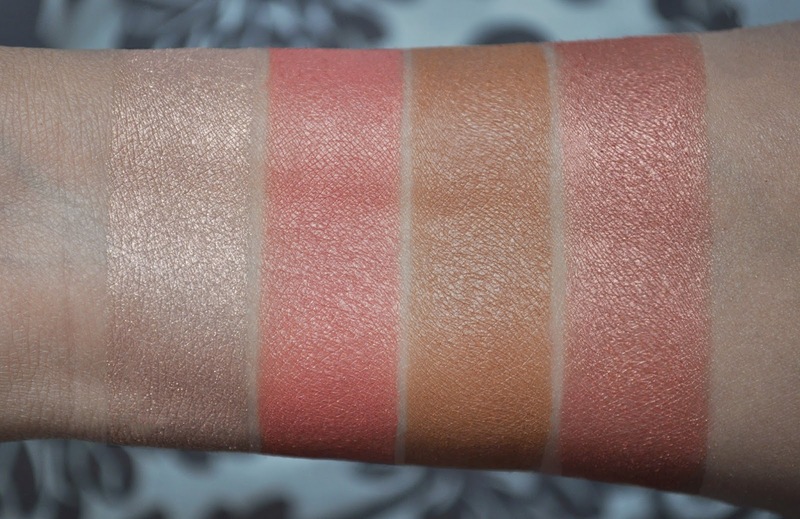 From left to right: Just Peachy, Candied Peach, Caramelized, Bless Her Heart, Bellini, Puree. Just Peachy: a shimmery, medium, coral-rosy pink with a gold duochrome. 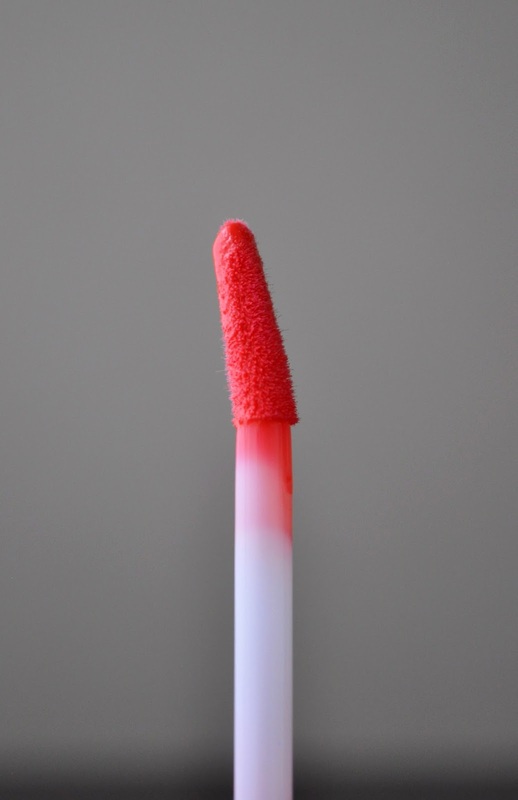 Candied Peach: a matte, muted, orange-coral with micro hot pink glitter. Caramelized: a frosted, deep warm bronze. Bless Her Heart: a frosted, murky, warm grayish-brown based olive. Bellini: a frosted, medium, warm, muted, pinky-peach with a gold duochrome. 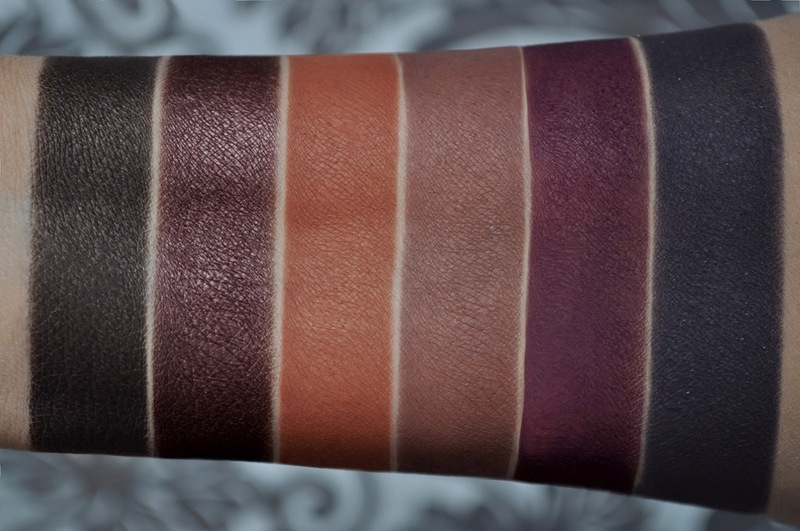 Puree: a matte, deep. muted sepia. From left to right: Tempting, Peach Pit, Summer Yum, Charmed, Delectable, Talk Derby To Me. Tempting: a shimmery, muted, blackened tarnished khaki-brown. Peach Pit: a shimmery, dark, muted maroon with a plummy shift. Summer Yum: a matte, deep, muted reddened-terracotta. Charmed, I'm sure: a matte, muted, warm deep, brown-based taupe. Delectable: a satiny-matte, dark, warm reddened-eggplant purple. Talk Derby To Me: a satin, blackened, dark plum with micro violet glitter. 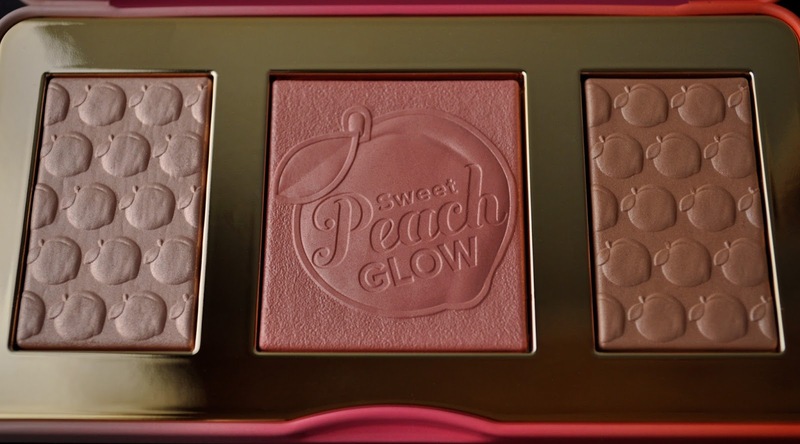 From left to right: Illuminating, Blushing, and Bronzing Palette, Papa Don't Peach Blush. A frosty, golden peachy-pink champagne with micro gold shimmers. A satin, warm, golden brown with yellow undertones. A frosted, warm, coppery-pink-coral with a golden sheen. From left to right: Papa Don't Peach, Peach Tease, Poppin' Peach, Tickle-Me-Peach. Papa Don't Peach: a muted, pinkish-peach-brown. 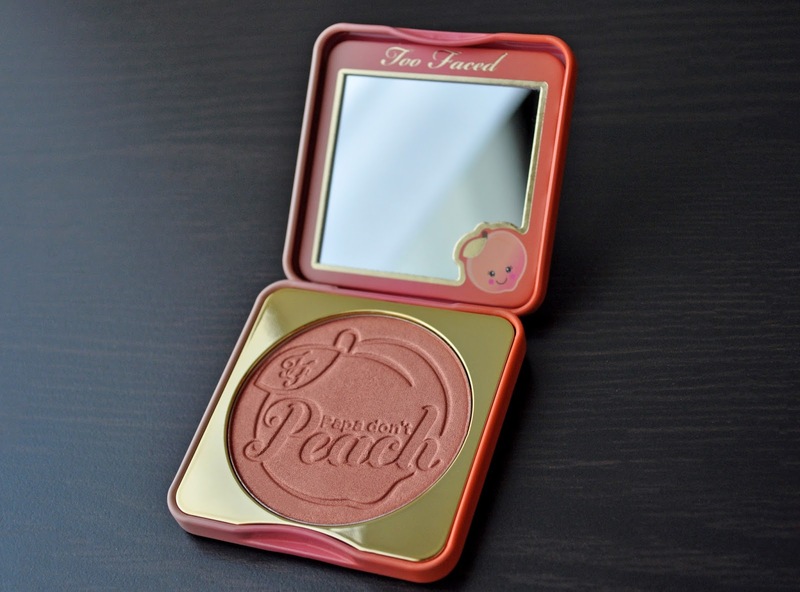 Peach Tease: a warm, pinky-coral. Poppin' Peach: a warm, yellow-based orange. Unfortunately, I don't have some of the Sweet Peach looks, as they were on my SD card, which Aki borrowed, and took with him on his business trip. I'll upload them to this post as soon as he emails me. Until then, here is one look I wore yesterday. Bobbi Brown Hydrating Eye Cream: Used to prep the lid and under-eyes). Nars Soft Matte Creamy Complete Concealer in Custard (used under the eyes). MAC Paint Pot in Utterly Becoming (used as an eyeshadow base). 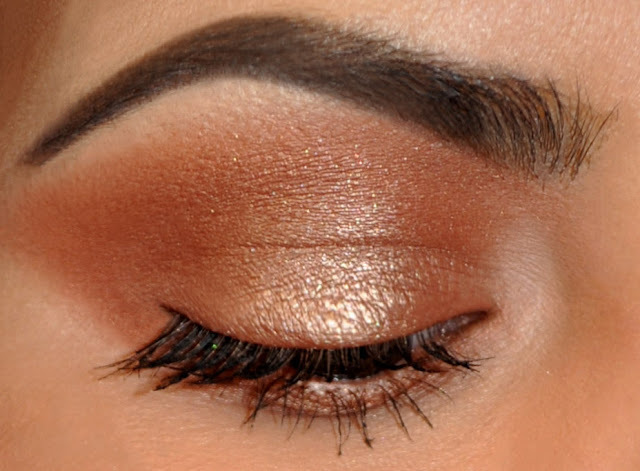 Summer Yum Eye shadow (blended all over the lid to a feline-point in the outer corner, as well as the lower lashline). ADDICTION Eyeliner Pencil in Rabbit Hole (used to tightline). MAC Technakohl Liner in Plank (on the water line and along the lower lashes). 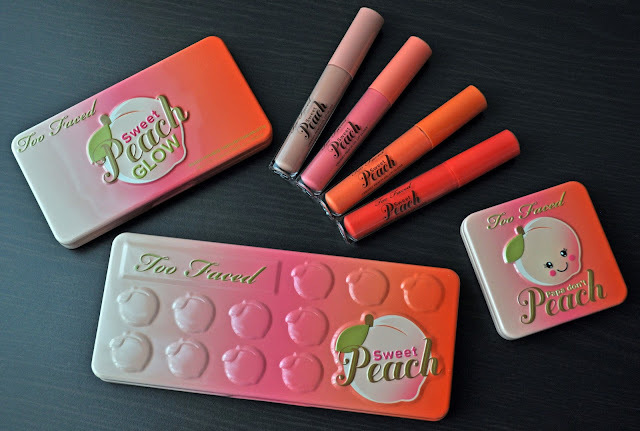 Overall, I like all the products minus the Sweet Peach Creamy Peach Oil Lip gloss (those will probably be going on a blog sale). 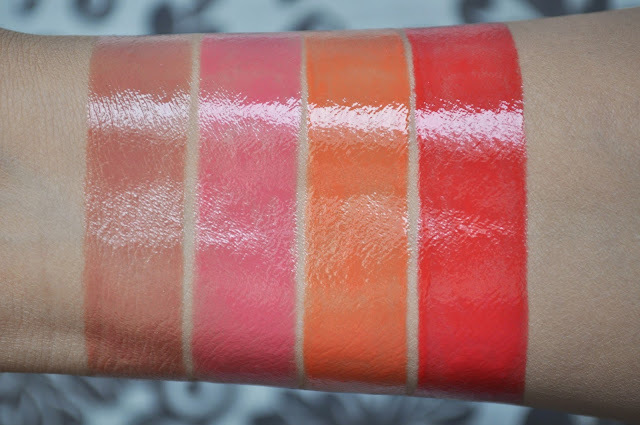 So, if you're interested, each of the glosses have been swatched. I have not put the doe-foot applicator directly on my lips (each used once with a disposable applicator), and you can have them all for 4,500 yen...and, that includes shipping.